While you enjoy the great song by the Fab Four, let me tell you something: The revolution will not be centralized either. Thanks to Blockchain technology which is a hot topic around the world these days, we are about to see many things we’re accustomed to be changing or shape-shifting soon. Shopping, trading, transferring money, listening to music, voting and even getting married. However, does Blockchain really have the power and ability to change the whole world? The answer to this question is not that simple. Before finding an answer, I’ll try to explain why we need this newish kid in town and how it gets things done. We make payments several times a day. We pay for the meals we eat, the songs we listen to, the series we watch, and even the money we send to someone else. If you’re not paying with cash directly to the cafe or restaurant for the meals, to the artist for the song or to the director for the movie, there must be at least one intermediary involved in the transaction. And you know what we are exactly paying for? The trust they provide. However is it truly necessary to pay for this service? Satoshi Nakamoto, the inventor of Bitcoin and Blockchain technology, answered this question with a bold No in his white paper, Bitcoin: A Peer-to-Peer Electronic Cash System. So Blockchain is the Bitcoin, right? Blockchain is something much bigger, and more important than the Bitcoin itself. You can think of Blockchain as the internet and Bitcoin as the Arpanet. In the late 1960s, U.S. Department of Defense funded the invention of a single network, Arpanet, alowing multiple computers to communicate. This invention later evolved into WWW (World Wide Web) and there are millions of different applications of the internet technology now. Bitcoin was the first use case of Blockchain technology therefore telling the story of Bitcoin helps to explain how Blockchain works. Although there are many different versions and implementations of Blockchain technology out there, the tale I will tell below is how it was born and how it works in general today. The ones who are not really familiar with data structures and linked lists, just think of wooden boxes chained one by one. That’s really what a blockchain is. The key question here is of course: what do these boxes hold inside them? Anything of value can be held. The decision is up to the developer. I told you there are many different implementations of Blockchain technology. 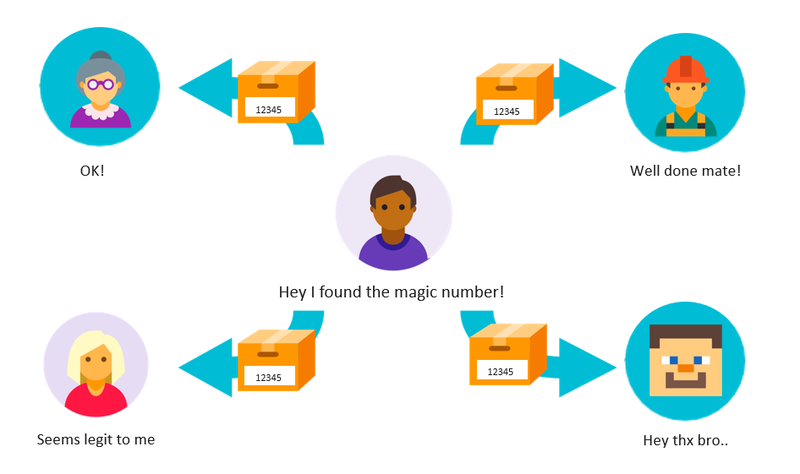 While Bitcoin blockchain boxes hold transaction information between parties, Ethereum blockchain boxes hold smart contracts in addition to transactions. Your own blockchain box may hold anything you want. Perhaps it could hold your friends’ names or the phone numbers of people calling you. Why do we keep these things inside these boxes? Because these boxes and the information inside them can not be changed or destroyed once they are added to the chain. So, a blockchain is an incorruptible and immutable digital ledger recording everything of value. Distribution of this ledger among every network joiner makes it decentralized which means there is no central control unit on the chain. Every single unit has an equal voice and authority. Keeping this in mind, let’s move on with the Tale of Magical Boxes. Once upon a time, there was a wizard called Satoshi and he decided to come up with a new way of transferring gold. He created an orange box and cast a magic spell to turn colorless boxes orange by carving a random number on them. He claimed that his box would be the first box of a special chain and anyone could extend it by adding another orange box. Besides being orange, every new box also must have included a small picture of the previous box and people’s transfer requests written on a piece of paper. The first person packing these in a colorless box and then finding the random number to turn it orange would be awarded with a bag of gold. 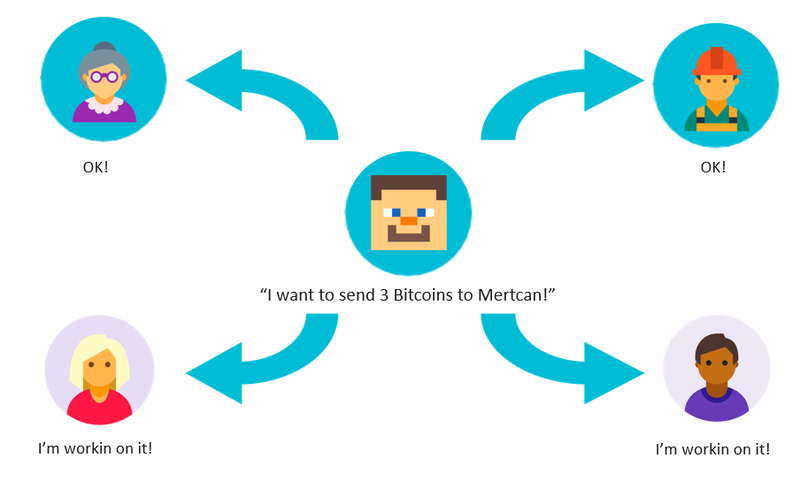 A guy named Anil from Satoshi’s village, wanted to try this method to send some gold to his friend Mertcan and he let everyone holding the chain know about the transaction. Some chain holders didn’t want to spend their time and energy to find the random number and they just checked if Anil had enough gold by skimming through the previous papers inside the boxes on the chain. As he had enough, they confirmed the transaction so the people willing to spend their time and energy on a box could include this transaction inside their boxes. Blue background people are just confirming the transaction while pink backgrounds are willing to enter the contest to find the random number. Enthusiastic chain holders in the village collected transactions like these into a colorless box and they tried numbers one by one to find the magical random number that would turn their box orange. A guy named Alp was the quickest to do that and he found the number 12345. He quickly let the others know that he found the number and he passed the number along with his box. His box would not be added to the chain immediately as he had to convince majority of the chain holders that his number or box was not fake. When all the other chain holders were convinced that Alp has really worked and found the number, they added this box to their chains and start working on the new one. Convincing the other chain holders is easy as they will only try the number on the box Alp sends and see if it becomes orange or not. By telling this tale, I wanted to show how Bitcoin and the Blockchain technology behind it works. Bitcoin and the majority of the other coins are working as Proof of Work systems which basically relies on proving you that have found the special number, just like Alp did in our tale. There are many other alternatives to this system (eg. Proof of Stake) and I will talk about them and their advantages in later parts of this article. I will also give some technical details by referring to this tale and I am sure it will help you understand why this chain and the boxes in it are impossible to change or destroy. For now, let’s be happy for that Anil and Mertcan could made their transfer without any intermediaries and that Alp got his prize.